Plot: Jim Wormold is an expatriate Englishman living in pre-revolutionary Havana with his teenage daughter Milly. He owns a vacuum cleaner shop but isn’t very successful so he accepts an offer from Hawthorne of the British Secret Service to recruit a network of agents in Cuba. 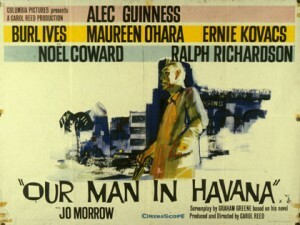 Based on the novel by Graham Greene.